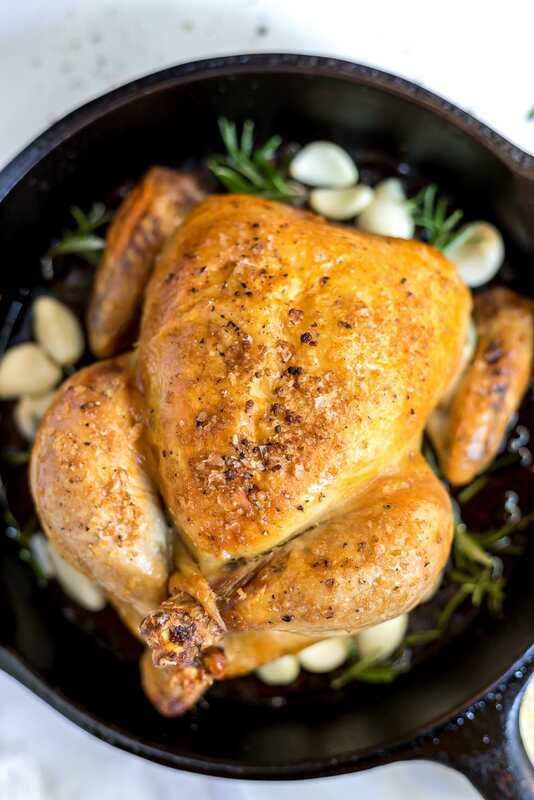 This Easy Roast Chicken Recipe is for any of you wanting to know how to roast a whole chicken. A few simple ingredients and you have dinner on the way. 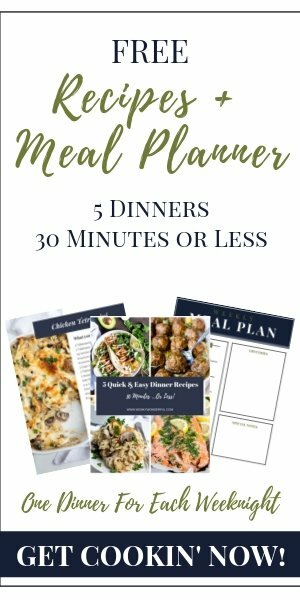 This healthy supper is low carb, dairy free, gluten free, Whole 30, Paleo and Keto friendly. It is simple to Roast a Chicken in the Oven. I’m showing you How To Roast a Whole Chicken the easy way. What makes this roasted chicken so easy? Well, I keep the ingredients and prep super simple and I don’t fuss with the oven temperature. Just toss your chicken in the oven and bake until the internal temp reaches 165ºF. To be totally honest, I used to be intimidated by cooking meat. I felt like I could never achieve that perfect roast chicken or medium rare steak. All of the recipes I tried certainly didn’t help matters. There were always so many steps and sometimes I didn’t even know what the heck they were talking about. And my food never ended up looking gorgeous (not even close!). You shouldn’t have to attend culinary school just to make a family dinner! After years of research, experience and trial and error . . . I now understand all of those recipes. And, nothing against them and their preferred methods, but it just shouldn’t be that difficult. My preferred cooking method is EASY. What is the quickest and easiest way for me to get a tasty dinner on the table? Maybe I should rename my site to The Lazy Cook because seriously, I’m all about recipes that take the least amount of time, least amount of effort and least amount of dishes. But, I still want to eat great tasting nutritious food. Annnnywayyy, I’ll end this rant now and just get to the Easy Roast Chicken Recipe. 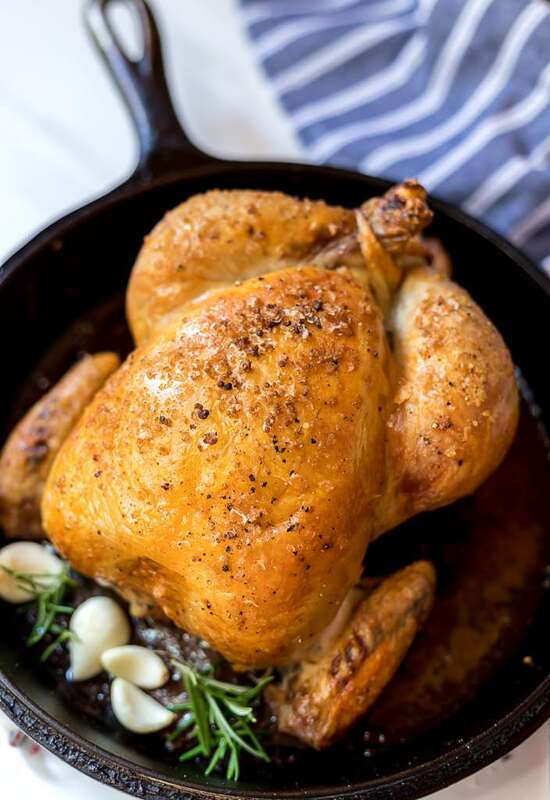 I love a good old fashioned roasted whole chicken because it’s great for busy weeknights or lazy weekends. Prepare your side dish of choice and you got yourself a meal. Why and how do you truss a chicken? Trussing a chicken is basically tying the wings and legs close to the body to ensure an evenly cooked (pretty) chicken. How Long to Roast the Chicken? This will vary depending on your oven and the size of your chicken. Really, my cooking life became so much easier when I finally started using a meat thermometer. For a 4lb chicken you will want to start checking the internal temp at about 55-60 minutes. Do you cook the chicken covered or uncovered? Drop the oven racks down to the lower third (the second rung up) to keep the breast from burning. I leave my chicken uncovered to get that great golden color. Keep an eye on it towards the end and if it looks like it may burn, just drape some tin foil over the top for protection. 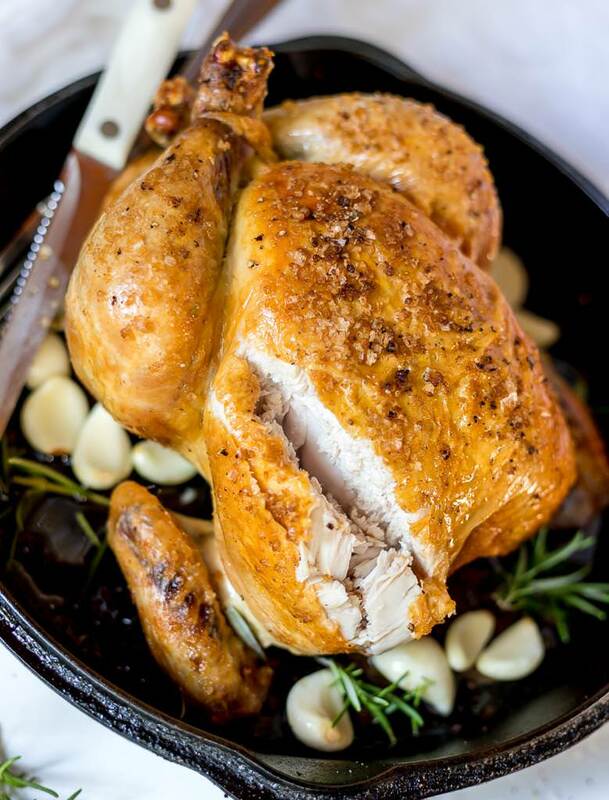 What tools do you need for this roasted chicken recipe? 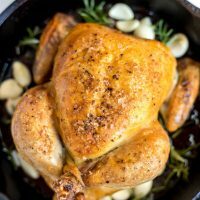 I use a Large Cast Iron Pan to roast my chicken because I think it heats up really well. You will also need that Meat Thermometer for precise cooking. 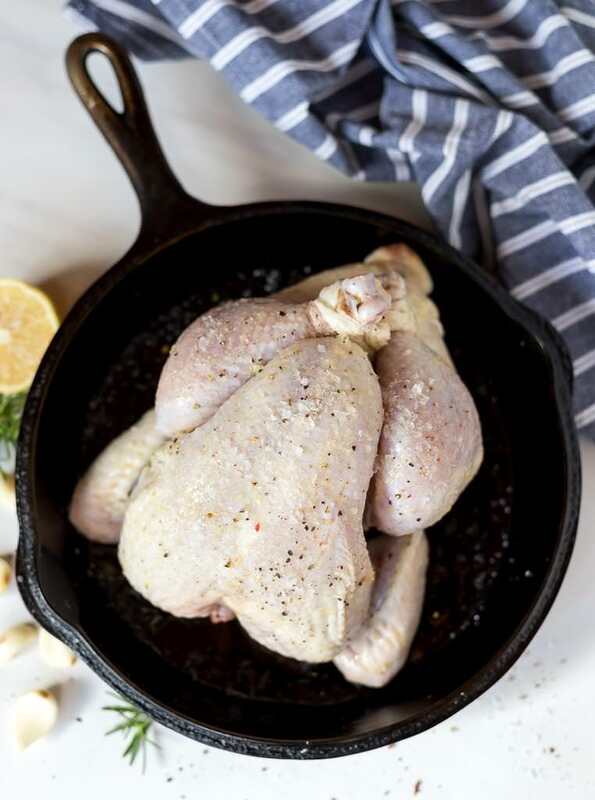 Place chicken in large cast iron pan (or roasting dish). Stuff chicken with preferred flavors: I stuff with 1/2 lemon, 4-5 garlic cloves and rosemary. Rub olive oil over the entire chicken. Generously sprinkle with flaked sea salt and a pinch of pepper. Roast chicken uncovered in oven for 60-75 minutes. Begin checking internal temp at approximately 50-55 minutes. If chicken begins to get too dark, drape foil over the chicken to prevent burning.